You are almost there... you’ve found your jars and containers, the selection of candies is finalized, it’s time now to add a few decorations to complete the look. Glass jars filled with dazzling candies are great looking just the way they are. You can however, dress them up by wrapping around stripes of fancy ribbons, strings of beads, and adding elegant labels to indicate the type of candy. Make sure you have enough small containers, plastic scoops and tongs that are perfectly sized to fit with your candy jars and containers. Order a few extra flower bouquets for your candy buffet; or find interesting items such as topiaries, wood boxes, baskets, figurines, candlesticks, picture frames, or anything in harmony with the style and theme of your wedding venue. The tablecloth and backdrop can also be decorated with banners, lettering, pom-poms, fabric, ribbons, and bows. 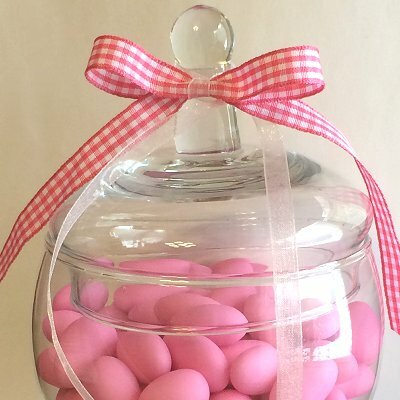 Test the display of your candy buffet with empty glass jars before the big day. You may need to use risers under the tablecloth to elevate some of the glass jars. The jars should be elevated just high enough to be interesting and able to reach and scoop the candy easily. Review carefully every elements of your candy buffet to make sure the display is attractive and also functional. As the big day approach, don’t wait until the last minute to order the candies. They will stay fresh in their sealed bags, kept at room temperature, and away from direct sunlight or heat source. If you are filling your jars a day before the wedding, tightly cover them with a good quality plastic wrap, and insert each one into a strong plastic bag that you firmly tie. Wrap each jars and lids separately with dish clothes or bubble wrap, and carefully set them in a cardboard box. Add strips of cardboard between jars, making sure they are secure and are not touching each other while transporting them to the reception venue.